Letra: Fanny Crosby, 1873. My friend, Mrs. Joseph F. Knapp, composed a melody and played it over to me two or three times on the piano. She then asked what it said. I replied, Blessed assurance, Jesus is mine! This hymn was sung in the Academy Award winning movies Places in the Heart (1984) & Trip to Bountiful (1985). Based on the number of hymnals in which it appears (over 850), this song is Fanny's most popular work. Música: "Assurance" Phoebe Palmer Knapp, 1873. [ — — ].
. 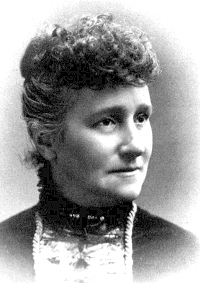 Though blinded by an incompetent doctor at six weeks of age, she wrote over 8,000 hymns. About her blindness, she said: "It seemed intended by the blessed providence of God that I should be blind all my life, and I thank him for the dispensation. If perfect earthly sight were offered me tomorrow I would not accept it. I might not have sung hymns to the praise of God if I had been distracted by the beautiful and interesting things about me".
. In her lifetime, Fanny Crosby was one of the best known women in the United States. To this day, the vast majority of American hymnals contain her work. When she died, her tombstone carried the words, "Aunt Fanny" and "Blessed assurance, Jesus is mine.